What forces layout/reflow. The comprehensive list. margin [-top, -right, -bottom, -left, or shorthand] only if the margin is fixed. padding [-top, -right, -bottom, -left, or shorthand] only if the padding is fixed. Quite a lot; haven't made an exhaustive list , but Tony Gentilcore's 2011 Layout Triggering List pointed to a few. Reflow only has a cost if the document has changed and invalidated the style or layout. Typically, this is because the DOM was changed (classes modified, nodes added/removed, even adding a psuedo-class like :focus). If layout is forced, style must be recalculated first. So forced layout triggers both operations. Their costs are very dependent on the content/situation, but typically both operations are similar in cost. for loops that force layout & change the DOM are the worst, avoid them. 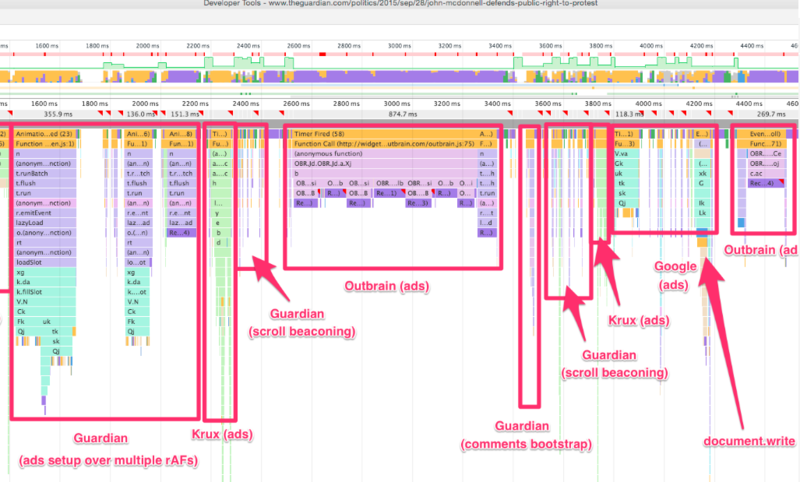 Use DevTools Timeline to see where this happens. You may be surprised to see how often your app code and library code hits this. Batch your writes & reads to the DOM (via FastDOM or a virtual DOM implementation). Read your metrics at the begininng of the frame (very very start of rAF, scroll handler, etc), when the numbers are still identical to the last time layout was done. Timeline trace of The Guardian. Outbrain is forcing layout repeatedly, probably in a loop. The above data was built by reading the Blink source, so it's true for Chrome, Opera, and most android browsers. Tony Gentilcore's Layout Triggering List was for 2011 WebKit and generally aligns with the above. No concrete data on Edge/IE, but it should fall roughly in line, as the return values for these properties are spec'd. What would differ is the amount of clever optimization.